Celestial Visions - Home tags. Inspired by the cosmos, culture and landscape, Celestial Visions is a consultancy, research and astro-imaging resource centre, led by Western Australian creative developer and astro-photographer, Dr John Goldsmith. This site provides an introduction to projects and collaborations by Celestial Visions, and an introduction to astro-imaging, timelapse and panoramic photography resources available. For all enquiries, please use the contact page. Thank you, and enjoy ! Please note that all images, videos and text on this web site are strictly copyright protected. Enquiries regarding image usage and publications are welcome. The Universe. Yours to discover” Astrophotography exhibition is a collaborative invitational astrophotography exhibition featuring works by Western Australia’s talented astrophotography community. The exhibition presents astrophotography by Carol Redford, James Athanasou, Mark Bridger, Paul Sartory, William Vrbasso, Dr John Goldsmith, Brendan Mitchell, Trevor Lundstrom, Colin Jenkinson & Brett Turner. Curated by Dr John Goldsmith from Celestial Visions. Enquires regarding hosting the exhibition should be directed to Dr John Goldsmith. 10am to 3pm daily. $5 Adults, gold coin donation / children. “The Universe. Yours to discover” Astrophotography exhibition is the first Australian astronomy event affiliated with Global Astronomy Month 2019 / Astronomers Without Borders. ​A special commemorative edition marking the occasion of the first ten years of the Astrofest Astrophotography Exhibition, celebrated in 2019. The Universe. Yours to discover, Volume 2, features the superb astrophotography of 31 astro-photographers. The 88 page full colour hard-cover book is expected to be available in March 2019. Volume 2 (2019) follows the publication of the first exhibition book in 2015. 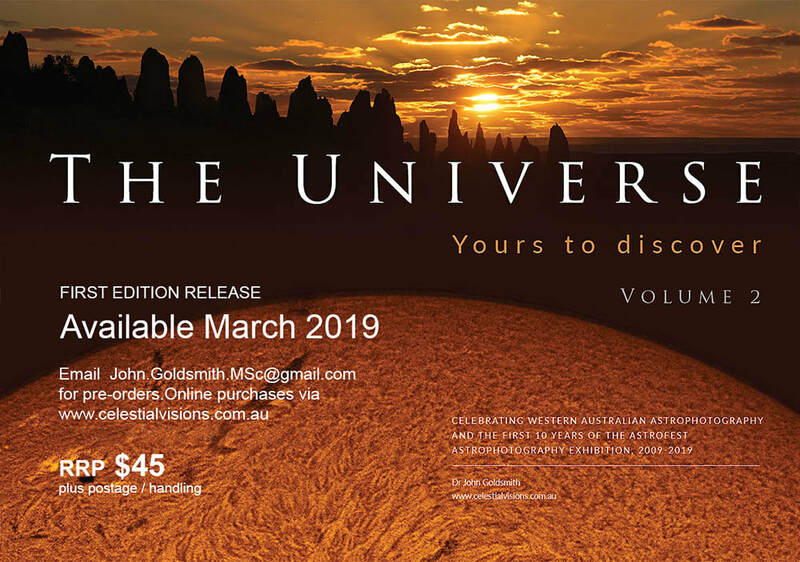 Authored by Dr John Goldsmith and produced by Celestial Visions, both volumes provide a superb record of astrophotography from Western Australia. Dr John Goldsmith, Celestial Visions, is attending the 2018 Astrofest event in Romania. Dr Goldsmith is presenting the first public screening of "The Borderless Sky, The Aboriginal Sky of Australia" TV episode, as part of the Astrofest event. Located in Targoviste, approximately 75 km north west of Bucharest, Romania, the 2018 Astrofest event attracts astronomy enthusiasts from Romania and international participants including the president of Astronomers Without Borders, Mike Simmons (USA), Jessica Santascoy (AWB) and Audrey Fischer (International Dark-sky Association). Dr Goldsmith participated in a 2 hour live TV astronomy broadcast, hosted by Valentin Grigore, SARM, Romania at Columna TV. The accompanying photos show some astro-night photos of Chindia Tower, built in the 15th Century, by Prince Vlad Tepes, (Vlad the Impaler). Postcards from Astrofest 2018, Targoviste, Romania. Astronomy and geology lovers were treated to a real Australian outback festival, at Astro Rocks 2018, held at Mount Magnet, Western Australia, on the weekend of 14-15 September. The festival included the Australian premiere screening of The Borderless Sky, The Aboriginal Sky of Australia, one of five episodes produced by Taglicht Media, Berlin. The film featured the astrophotography journey of Dr John Goldsmith, to some of the best astrophotography landscapes in Western Australia, and his encounters with Aboriginal stories of the night sky. 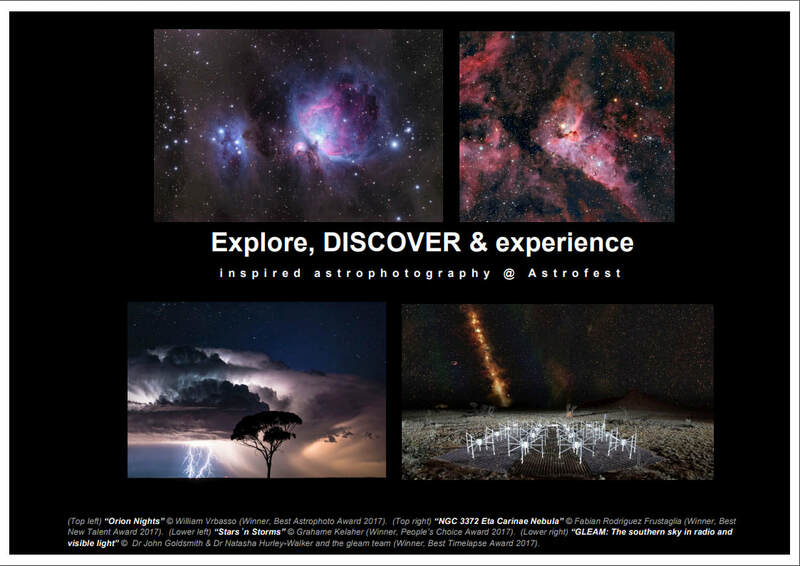 The Astro Rocks festival also featured the latest (2018) Astrofest Astrophotography exhibition, which has been presented each year, since the beginning of the Astro Rocks festival, six years ago. Premiered at the Astrofest 2018 Astrophotography Exhibition. 24th March 2018, Western Australia. Awarded the Best Timelapse Video. This timelapse video features two of Western Australia’s best locations for astrophotography; the Pinnacles (Nambung National Park) and Lake Ballard (the site of Sir Antony Gormley’s Inside Australia project). Timelapse scenes, based on motion control timelapse, provide a dynamic view of the night sky. The video shows scenes featured in a film production called “The Borderless Sky”, produced by Taglicht Media, Berlin, Germany, a five episode series featuring the journeys of five astrophotographers around the world from The World at Night (twanight.org). Photographer: Dr John Goldsmith. Image capture: Canon 5D MkII, 24mm lens, Dynamic Perception motion control timelapse system. Premiered at Astrofest 2018. Version: Letterbox 001 Music: "Endorphine" by NeXuS, powered by Jamendo.com Original timelapse available in 4K resolution. 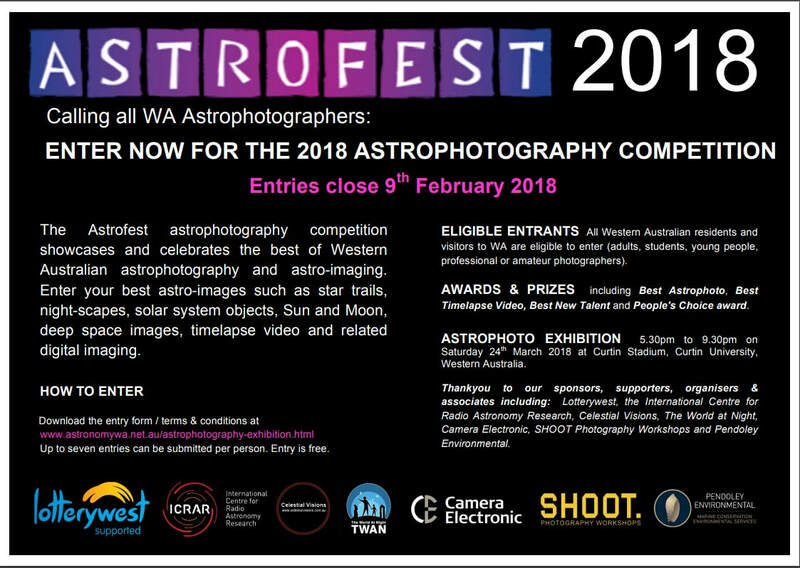 The Astrofest 2018 Astrophotography Competition, now in its ninth year, has premiered at Astrofest on Saturday 24th March 2018 at Curtin Stadium. We received a record 52 entrants and 224 entries, making 2018 a very competitive year. The exhibition featured a diverse range of astrophotography, including astro-landscapes, high resolution planetary and lunar images, widefield and deepspace astrophotography. Mark Bridger, Jon-Paul Bullard, Joshua Bunn, Luke Busellato, Chris Curgenven, Jason Eagle, Gary Hogg, John Goldsmith, Stephen Humpleby, Simon Li, Boyang Liu, Andrew Lockwood, Carol Redford, Fabian Rodriguez Frustaglia, Paul Sartory, Glenn Shuttleworth, Ronald Tan, Brett Turner & William Vrbasso. Total Lunar Eclipse, Fremantle, Western Australia. Skywatchers have been treated to a superb view of the so-called Super Blue Blood Moon, the Total Lunar Eclipse of 31 January 2018. "Super" because the moon appears larger than usual, "Blue" because January has had TWO full moons in the one month, and "Blood" due to the orange red colour from the Total Lunar Eclipse. These images show the progression of the rare eclipse, as viewed from the Roundhouse, Fremantle, Western Australia. The buildings along High Street feature a very special site specific art work, in which ellipses are viewed from one specific vantage point. The art work was created by the world renowned Paris based Swiss artist Felice Varini. Called "Arc d'Ellipses", the ellipses appear to float into view, and stretch across the building surfaces for over 800 metres. Ellipses form the orbital pattern for astronomical objects that revolve around each other by gravity, such as the Moon around our planet, our planet around the Sun, and also comets in orbit around the Sun. These views combines both the spectacle of a rare nature astronomical event together with an innovative art project, from a unique vantage point. The event was enjoyed by many skywatchers, and for some, it was their first view of a Total Lunar Eclipse. Celestial Visions is proud to support the 2018 Astrofest Astrophotography Exhibition. Dr John Goldsmith, the creative developer behind Celestial Visions, has provided the curatorial support to the exhibition, since 2009. The Astrofest astrophotography competition showcases and celebrates the best of Western Australian astrophotography and astro-imaging. Enter your best astro-images such as star trails, night-scapes, solar system objects, Sun and Moon, deep space images, timelapse video and related digital imaging. Entries close on 9th February 2018. Up to seven entries can be submitted per person. Entry is free. ELIGIBLE ENTRANTS All Western Australian residents and visitors to WA are eligible to enter (adults, students, young people, professional or amateur photographers). AWARDS & PRIZES including Best Astrophoto, Best Timelapse Video, Best New Talent and People's Choice award. ASTROPHOTO EXHIBITION 5.30pm to 9.30pm on Saturday 24th March 2018 at Curtin Stadium, Curtin University, Western Australia. Thankyou to our sponsors, supporters, organisers & associates including: Lotterywest, the International Centre for Radio Astronomy Research, Celestial Visions, The World at Night, Camera Electronic, SHOOT Photography Workshops and Pendoley Environmental. The Borderless Sky is a new five-part episode TV series, featuring the astro-photography adventures and journeys of five members of “The World at Night”, Babak Tafreshi (Iran/USA), Dr John Goldsmith (Australia), Yuichi Takasaka (Canada), Gernot Meiser (Germany) & Bernd Proschold (Germany). Australia’s iconic landscapes provide a superb vantage to experience the splendours of the southern night sky. Australia’s ancient, complex and contemporary Aboriginal cultures also provide fascinating perspectives of the southern night sky. The Australian episode of The Borderless Sky follows astrophotographer Dr John Goldsmith, during his astrophotography adventures to document the southern night sky above iconic Western Australian landscapes including the Pinnacles, Lake Ballard and the Kimberley. ​The 6000km astrophotography journey to the remote Australian “outback” provides an opportunity to experience the exceptionally dark southern night sky. Travelling to the Kimberley in the far north of Western Australia, Dr John Goldsmith meets up with Scott Murray, a Northern Territory astrophotographer, and they continue towards their goal of astrophotography at Kandimalal, Wolfe Creek Meteorite Crater, a massive, ancient impact crater located on the edge of the Great Sandy Desert. In co-production with ZDF and in cooperation with ARTE. Distribution by Albatross World Sales. A film by Christian Schidlowski. Produced by Taglicht Media, Berlin. Executive Producers Claudia Zenkert & Uli Veith. “The Borderless Sky” © 2017, Taglicht Media. ​A special collaboration between The International Centre for Radio Astronomy Research, the GLEAM team and Celestial Visions has produced a remarkable composite image of the southern cosmos at radio frequencies. The image appears in the August 2017 edition of the National Geographic magazine "The Space Issue". The composite image combines the newly generated "GLEAM" radio image of the night sky, appearing above the radio astronomy antennas known as the Murchison Widefield Array, located in Western Australia. The image is part of a timelapse sequence, which won the 2017 Astrofest Astrophotography exhibition "Best Timelapse" award. Image credit: GLEAM radio image: Dr Natasha Hurley-Walker and the GLEAM Team, International Centre for Radio Astronomy Research, and Dr John Goldsmith / Celestial Visions. ​Celestial Visions has collaborated with the Detroit Zoo’s “Penguinarium” project, a $30M conservation centre in Michegan, US. The centre is home to 80 penguins and visitors view the penguins via an underwater gallery. The centre provides a unique 4D immersive experience, featuring the polar explorer Sir Ernest Shackleton’s Antarctic expedition and his epic crossing of the Drake Passage. Visitors experience the immersive experience as if on Shakleton’s ship, the Endurance. Celestial Visions provided 360 degree astro-imanging as part of the visitor’s immersive experience. Dr John Goldsmith has contributed to the newly released book called "The Imagined Sky", with a chapter that introduces his PhD research into Aboriginal sky knowledge from Western Australia. This volume features eleven essays that offer critical engagement in understanding the sky in human imagination and culture and contribute to the new fields of cultural astronomy and skyscapes, the role and importance of the sky in the interpretation of cultures, emerging within the academy, and is written by some of the most noted scholars in their fields of British history, history of art, social anthropology, Greek horoscopes and narratology, globe cartography, comets and Irish mythology, western astronomy, Australian aboriginal sky astronomy and mythology, and cultural astronomy and astrology. 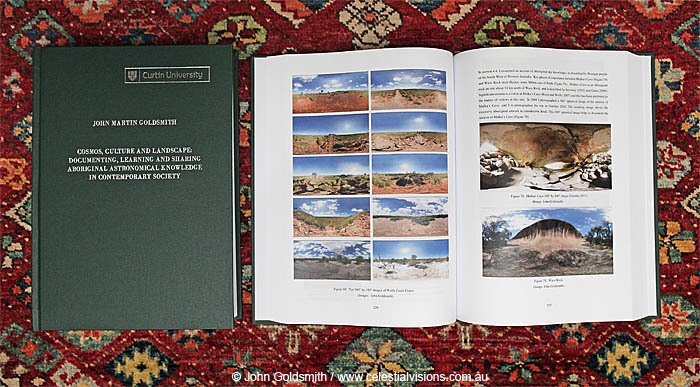 Dr Goldsmith's chapter "Cosmos, Culture and Landscape" examines various aspect of Aboriginal sky knowledge, with a focus on Wolfe Creek Meteorite Crater. Edited by Darrelyn Gunzburg, "The Imagined Sky" is available in paperback and hardback. More than 4000 visitors enjoy Astrofest 2016 ! Astrofest 2016, held on Saturday 12th March at Curtin Stadium was a huge success, with more than 4000 visitors attending. The Astrophotography exhibition featured a fantastic selection of astro-images, with astro-landscapes featuring strongly. 20 Western Australian astrophotographers have had their work exhibited in the 2016 exhibition. This year we mark the milestone of our 20,000th visitor to enjoy the exhibition, since 2009. To everyone involved, well done ! The Best Astrophoto Award went to Andrew Lockwood for "The large cloud of Magellan". Andrew receives a certificate, laser engraved trophy and a $300 voucher from Camera Electronic. The Best New Talent Award went to Wayne Riley for "Bungle Bungles Milky Way". Wayne receives a certificate, laser engraved trophy and a $300 voucher from Camera Electronic. The People's Choice Award went to "Sugarloaf Rock under a setting Milky Way" by Jon-Paul Bullard. Jon-Paul receives a certificate and laser engraved trophy. Paean Ng for North Mole (Fremantle) Moonset. Luke Hetherington for The Pulpit. Kylie Gee for Standing tall under the stars. Jon-Paul Bullard for his two versions of Sugarloaf Rock. Thanks goes to all of our sponsors, judges and supporters, in particular, Camera Electronic / SHOOT Photography Workshops (sponsor of the Best Astrophoto Award) and Pendoley Environmental (sponsors of the Best New Talent Award), Lotterywest, ICRAR, The World at Night and Celestial Visions. The exhibition judges included Dr David Malin (davidmalin.com), Prof Peter Quinn (ICRAR) and Prof Andreas Wicenec ICRAR). $39.95 AU (rrp). Available now ! A new commemorative book presents highlights from the first five years of the Astrofest astrophotography exhibition, 2009-2014. This full colour photographic book showcases Western Australian astrophotography, including deep space images, widefield constellation images and iconic Western Australian night-time landscapes. "The Universe. Yours to discover" was launched at Western Australia's 2015 Astrofest, on Saturday 28th March 2015 at Curtin Stadium, Curtin University. Foreword by Dr David Malin, edited by Dr John Goldsmith. Please visit our online store for online purchases. "The Universe, yours to discover" first edition book release. Western Australian Museum (Geraldton, WA). Friday 22 May - Saturday 23 May 2015. Mt Magnet Astronomy Festival. Saturday 28 March 2015. Astrofest, at Curtin Stadium, Curtin University. 6.30pm Saturday 28 February 2015 World record attempt, largest astronomy lesson, Maida Vale Reserve, Lesmurdie. Monday 23 February - Tuesday 24 February 2015. Australian Planetarium Conference, Scitech. Regional Western Australian communities are enjoying the latest installment of the Astrofest astrophotography exhibition. Presented at the Western Australian Museum (Geraldton), the exhibition features the latest images from the 2015 exhibition. The exhibition is on display between 7 August and 6 September 2015 and features during national science week. Events included the official opening by curator Dr John Goldsmith, a public presentation "The Universe. Yours to discover", guest tours with Geraldton high school groups, media interviews and a student outreach via Meekatharra School of the Air. Astrofest 2015 a great success ! Western Australia's biggest astronomy festival, Astrofest, has once again been a fantastic success. Over 4000 visitors enjoyed the one-evening event at Curtin Stadium, Perth. Celestial Visions curated the astrophotography exhibition for the sixth year, with a celebration of some of the best astronomical photography from Western Australia. Congratulations to Andrew Lockwood who won the Best Astrophoto Award, Kwon O Chul for the Best Timelapse Video Award, and to Paul Storey who won the People's Choice Award. The World at Night digital exhibition gave an international flavour to Astrofest , featuring superb astro-landscape photos from around the world. Dr John Goldsmith launched "The Universe. Yours to Discover" which features highlights from the first five years of astronomical imagery presented at Astrofest, 2009 - 2014. Thanks to all our participants, sponsors and supporters including Lotterywest, ICRAR, West Print Management Group, Camera Electronic, SHOOT Photography Workshops & The World at Night. John Goldsmith's PhD research into contemporary Aboriginal astronomical knowledge is now available online, from Curtin University. The PhD research investigates contemporary Aboriginal astronomical knowledge and features the highly successful Ilgarijiri- Things Belonging to the Sky Aboriginal art project and collaboration with radio astronomers from the Murchison Radio-astronomy Observatory, Western Australia. The research also investigated Aboriginal perspectives of Kandimalal, Wolfe Creek Crater, the 300,000+ year old meteorite crater located in the East Kimberley, Western Australia. Astronomical knowledge was examined via three surveys and in-depth video interviews with 27 participants. The research included site documentation via digital imaging (360° & timelapse), which was then used to create new and original Aboriginal astronomy resources, comprising a virtual tour and exhibition videos. John Goldsmith received the inaugural tertiary De Laeter Science Engagement Scholarship (Gravity Discovery Centre Foundation), for his video production featuring scientific and Aboriginal perspective of Wolfe Creek Crater. The PhD research was conducted at the International Centre of Radio Astronomy Research (ICRAR) at Curtin University, under the primary supervision of Professor Steven Tingay (ICRAR). Research findings are presented in the 556 page thesis, via 130 figures, 89 tables, 18 appendices, three surveys, transcribed interviews with 27 participants, several case studies, three video productions and one virtual tour (supplied on DVD disk). Cosmos, culture and landscape: Documenting, learning and sharing Aboriginal astronomical knowledge in contemporary society. Aboriginal and Torres Strait Islander persons are respectfully advised that this site contains images of persons who have passed away. Goldsmith, John., (in press). "Cosmos, Culture and Landscape: Documenting, learning and sharing Australian Aboriginal astronomical knowledge in contemporary s﻿ociety" book chapter in "The Imagined Sky". Editor: Darrelyn Guzburg. University of Bristol. Goldsmith, John (currently in peer review). "Exploring Space, Time and Colour via The World at Night". Spectrum, the Journal of the Colour Society of Australia. Goldsmith, John. 2014. The Ilgarijiri Project: A Collaboration between Aboriginal Communities and Radio Astronomers in the Murchison Region of Western Australia. Journal of Astronomical History and Heritage, 17(2), 205–215. Hamacher, Duane., and Goldsmith, John. 2013. ‘Aboriginal Oral Traditions of Australian Impact Craters’. Journal of Astronomical History and Heritage 16.3:295-311. Goldsmith, John. 2011. “Documenting natural and cultural places with 360° spherical images, panoramic and timelapse digital photography” Rock Art Research vol. 28 no. 1, pp. 123-127. Goldsmith, John., & Brocx Margaret. 2012. “A virtual tour exploring Wolfe Creek Meteorite Crater’s geoheritage, cultural and educational values”. Poster presented at the 34th International Geological Congress (IGC): Brisbane, Australia, 5 – 10 August 2012. Goldsmith, John., Tingay, Steven., & Hamacher, Duane. 2011. “Building bridges between cultures, communicating and sharing Australian Indigenous sky knowledge”. Poster presented at the ninth “Oxford” International Symposium on Archaeoastronomy, Lima, Peru, January 2011. Goldsmith, John. 2010. “Sharing and communicating Indigenous astronomical and sky knowledge”. Poster presented at the Astronomical Society of Australia annual science meeting, Hobart, July 2010. Goldsmith, John. 2000. “Cosmic impacts in the Kimberley”. Landscope Magazine, vol. 15 no. 3, pp. 28-34 Autumn 2000. Department of Conservation and Land Management, Western Australia. Goldsmith, John. 1999. “The emu in the sky”. Australian Geographic, The Journal of the Australian Geographic Society. July/September 1999 edition, no. 55. Australian Geographic Society. Terry Hills, NSW. City of Perth Draft Lighting Strategy, 2014. In response to the public comment period for the City of Perth draft Lighting Strategy, a collaborative submission has been prepared and submitted by John Goldsmith / Celestial Visions. The submission provides key information and a review of the draft strategy, from the point of view of astronomers and astro-photographers, and highlights the growing problem of urban light pollution. The submission is entitled "Enlightened, Illuminated or Light Polluted, a Public Submission on the Draft City of Perth Lighting Strategy". Everyone who has contributed input into the submission is thanked for their input. The draft submission is a PDF document available below for download. The PDF document is approximately 11 MB in size. Unsolicited expert review comments in relation to the public submission (reproduced by permission). "I want to congratulate John Goldsmith / Celestial Visions on one of the most professional submissions in relation to spill lighting. The amazing photography clearly demonstrates a convincing argument. The paper really is the best submission I have seen. We manage street lighting for cities and we incorporate dark sky in all our city designs. Adam Carey, CEO of Citelum Australia, member of the International Dark-sky Association. Celestial Visions has featured Sierra Leone's Refugee All Stars music in the latest Celestial Visions timelapse video of Cradle Mountain, Tasmania. 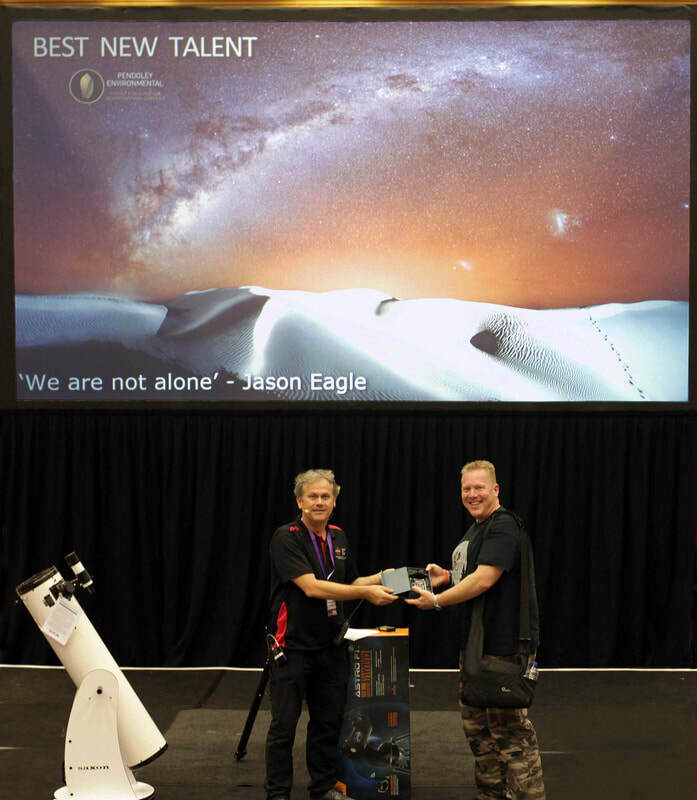 The video "Ocean Moonlight" won the Best Timelapse Video award at the 2014 Astrofest astrophotography exhibition. The video featured the evocative music track 10 "Toman Teti M'Ba Akala" from the Album Radio Salone. Soundtrack reproduced by permission of Sierra Leone Refugee All Stars management, 2014.